CLAUDIUS' portrait in bronze, high style. Claudius was born Tiberius Claudius Nero (later Germanicus) the son of Tiberius' brother, Nero Drusus and his wife, Antonia, in 10 B.C. . A sickly child, of awkward appearance, he was thought to be mentally feeble. He held no major political offices under either Augustus or Tiberius. 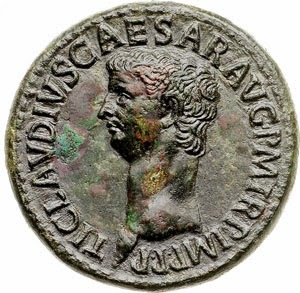 He was the uncle of Caligula, and under Caligula's reign he was named a consul in 37 A.D. .
Claudius went into hiding after Caligula was assassinated, but was found by praetorian guards and taken away to their camp. Much to his dismay, he was favored by them as Caligula's successor, and was soon proclaimed emperor by the praetorian guard. The senate initially opposed his elevation as a usurpation of their authority, but they eventually came to accept his authority, and he was eventually granted full imperium. After putting down some minor rebellions in the provinces, Claudius sought to assert Rome's power by expanding the borders of the empire. He invaded Britain and defeated the local forces, capturing their capital. He established the province of Britannia in the territory he conquered. The province was later expanded over time to include a much greater area. Due to his distrust of the standing senate, Claudius tried to pack the senate with members who would favor him. In doing this, he also set a precedent, by filling seats with senators from the provinces. This had never previously been done, and raised further animosity among the old guard senators. Claudius also fanned the fires by personally sitting as judge over cases of treason, which was previously in the domain of the senate. These actions further increased the power of the emperor at the expense of the senate. Claudius had four wives, the third of whom was Valeria Messalina, who was descended from Augustus' sister, Octavia. Valeria Messalina had a lover named Gaius Silius, and together they plotted to overthrow Claudius and put Claudius and Valeria's son, Britannicus on the throne. It was their intention to serve as his regents, and thus have the power of the throne in their own hands. The plot was uncovered, and Silius was arrested and executed. Valeria Messalina was forced to commit suicide. Claudius married his niece Agrippina the younger in 49 A.D., and she became his fourth wife. 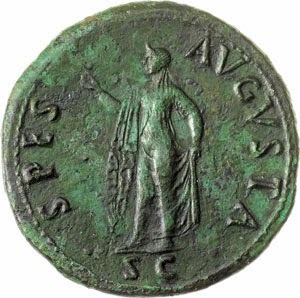 Claudius had her named Augusta while she was still living, and she was the first woman to be so titled in life. Hunger for power was not alien to Claudius' new wife, either. She did everything she could to see that her son from another marriage, Nero, would be named as Claudius' successor. Agrippina oversaw the engagement of Nero to Octavia, who was Claudius' daughter, thus securing his position in line. It is an unsubstantiated rumor that Agrippina had a hand in the death of Claudius. He died in 54 A.D., supposedly after eating poisonous mushrooms. He was, though, indeed succeeded by Nero as per his mother's intention. 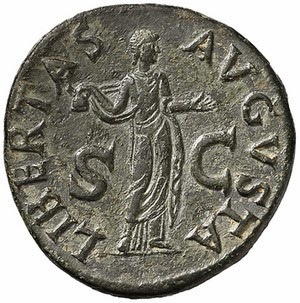 Claudius' numismatic legacy includes numerous reverses demonstrating virtues of the Augusta. 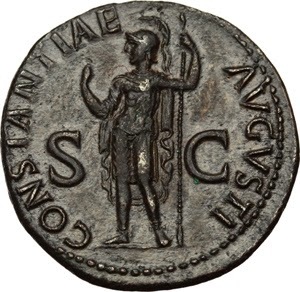 He also issued coinage to commemorate the support of the praetorian guard, showing their support of him, and his allegiance and gratitude to them. 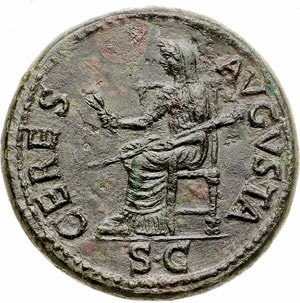 Another reverse that was widely used was "Constantiae Augusti", which meant "Perseverance of the Emperor", which was more or less a statement about Claudius' interactions with the senate. It is ironic, in the example illustrated here, that this inscription circles the letters SC.